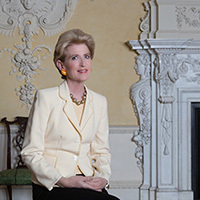 Emily Kernan Rafferty, President Emerita of The Metropolitan Museum of Art, served for 40 years at the Museum, as chief of institutional advancement, Senior Vice President of External Affairs, and as President from 2005 to 2015. As President, she was the Museum’s chief administrative officer, supervising a staff of some 2,000 full- and part-time employees and volunteers. Ms. Rafferty’s global experience in some 50 countries on behalf of the Museum included interactions and negotiations with many senior world leaders. In the U.S., she worked with government and private sector officials on initiatives involving funding, marketing, and multiple cultural issues. Ms. Rafferty served as a Board member of the New York Federal Reserve Bank 2011-2017, (Chair, 2012-2016), and Senior Adviser for Heritage Protection and Conservation for UNESCO, 2015 – 2017. She continues to serve as Chair of NYC & Company (the city’s tourism, marketing, and partnering organization), Board member of the National September 11 Memorial & Museum and as Board member of PJT Partners. She participated as an Advisory Board member of the eight-women Bipartisan Congressional Commission for The American Museum of Women’s History in D.C. (May 2015-December 2016), and continues as an advisor to the Smithsonian for the advancement of the Woman’s Initiative project. As principal of Emily K. Rafferty & Associates, she consults for many organizations, including Russell Reynolds Associates in the firm’s nonprofit practice and The Shed, a performing arts center under construction in Hudson Yards. She is an Advisory Director to Carnegie Hall, a member of the Advisory Council of the American University of Beirut, a Board member of Global Hope Coalitions, a member of the Advisory Board of TEFAF (The European Fine Arts Fair), and also a member of the Economic Club and the Council on Foreign Relations. Ms. Rafferty is a frequent speaker on topics relating to non-profit and board management, fundraising, cultural heritage and historic conservation, and has long been actively affiliated with a number of arts and inter-museum organizations. The recipient of many awards and honors, Ms. Rafferty was named by Crain’s New York Business one of New York City’s 100 most influential women from 2009 through 2013, and in Fall 2015 she was elected to their Hall of Fame. In 2012, she received the New York University Lewis Rudin Award for Exemplary Service to New York City. Emily Rafferty was appointed to the Commission by House Minority Leader Nancy Pelosi.